Use only Genuine NISSAN floor mats specifically designed for use in your vehicle model. For additional information, see a NISSAN dealer. This vehicle includes a front floor mat bracket to act as a floor mat positioning aid. Genuine NISSAN floor mats have been specially designed for your vehicle model. The driver’s side floor mat has a grommet hole incorporated in it. Position the mat by placing the floor mat bracket hook through the floor mat grommet hole while centering the mat in the floorwell. Allow the belts to dry completely in the shade before using them. 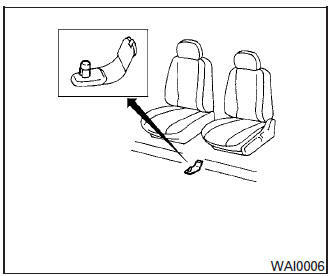 For additional information, refer to “Seat belt maintenance” in the “Safety – Seats, seat belts and supplemental restraint system” section of this manual. WARNING Do not allow wet seat belts to roll up in the retractor. NEVER use bleach, dye or chemical solvents to clean the seat belts, since these materials may severely weaken the seat belt webbing.